Both parties are expecting some amount of turnover in November, especially in Senate races, but also in contests for governor and the House. But it’s hard to recall a season in which so few incumbents got knocked off in the primaries. 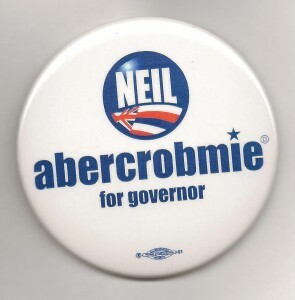 Maybe he wouldn’t have done so poorly if they spelled his name correctly on this button. Not counting Louisiana, which holds its “jungle” primary on election day, there are seven states that have yet to have their primary elections: Arizona, Florida and Vermont on Aug. 26, and Delaware, Massachusetts, New Hampshire and Rhode Island on Sept. 9. With the possible exception of Rep. John Tierney (D-Mass. ), no other House incumbent looks vulnerable in a primary. And in this “we hate Congress” year, how many representatives have been toppled in the primaries thus far? A total of three, all Republicans: Ralph Hall of Texas, Kerry Bentivolio in Michigan and Eric Cantor of Virginia. The first two are easy to explain: Hall is 91 years old, the oldest member of Congress; voters in his 4th District wanted new blood. Bentivolio is an odd duck, a reindeer rancher best known for his Santa Claus impersonations. He was first elected in 2012 only because the incumbent, Thad McCotter, was disqualified from the primary ballot after submitting some very questionable signatures; he later resigned from Congress. They’re still debating why Cantor, the House majority leader, lost his primary. Still, that’s three House members, the lowest amount since 2006, and simply surprising, given what people say they think about Congress. And in the Senate, the number of incumbents beaten in the primary this year was … zero. Stunning, when you think about it, considering all the hubbub over how the tea party was prepared to oust all those establishment Republicans, such as Mitch McConnell, Thad Cochran, Lindsey Graham, Pat Roberts and Lamar Alexander. History. Here’s a list of all the governors defeated in the primaries in the past half century. *In Louisiana, all candidates run on the same ballot, regardless of party, and the top two finishers advance to the runoff. In 1987, after Gov. Edwards finished second to Roemer, he decided against participating in the runoff.